Jack Lawrence wrote the lyric based on a title suggested by his partner Peter Tinturin. What Tinturin didn’t mention was that he had gotten the title originally from Irving Gordon. So when the song became a huge hit, Gordon sued through ASCAP and got partial credit for the song. 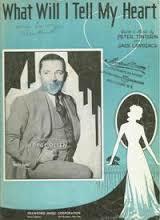 Due to Lawrence’s connections at Decca Records, the song was introduced by Andy Kirk and His Clouds of Joy, with charts by Mary Lou Williams, before they even had a publisher signed up. Other notable recordings include those by Ella Fitzgerald, Bing Crosby, Billy Eckstein, Fletcher Henderson, Kay Starr and Art Tatum. “What Will I Tell My Heart” was recorded on January 4, 1955 and released that year as a single. It was arranged by Percy Faith.